Heat shortening in skillet. Add rice. Cook, stirring constantly, about 10 minutes or until lightly browned. Add vegetables and continue cooking 2-3 minutes (optional). Add salt and water. Simmer over low heat 20-25 minutes or until rice is tender and excess liquid is evaporated. Makes 6-8 servings. Combine rice, water and salt. Bring to a boil, stir, cover, reduce heat and simmer 15 minutes. Meanwhile, saute onions, peppers and celery in margarine. Add tomatoes, sugar, chili powder. Add Worcestershire. Add cooked rice and simmer until thick. Pour into buttered casserole and top with cheese. Brown rice lightly with butter in skillet. Place in casserole with boiling broth. Cover and bake one half hour at 375 degrees. Take from oven and add vegetables and nuts, stirring and mixing well with fork. Return to oven for one half hour. Makes 8 servings. Beat eggs well. Add oil, onion, parsley and grated cheese. Combine with rice, salt and milk. Bake in 350 degree oven for 45 minutes. Very good served with chicken gravy. Melt butter and saute rice until lightly browned. Add onion and mushrooms and saute until tender. (If mushrooms are canned, add later.) Put into buttered casserole and pour beef consomme and water over the top of the rice. Cover and bake at 350 degrees for 45 minutes. Serves 12. Brown rice in melted butter in frying pan. Grease casserole and add browned rice and other ingredients. Cover and cook in 300 degree oven for about one hour. Sprinkle almonds on top. 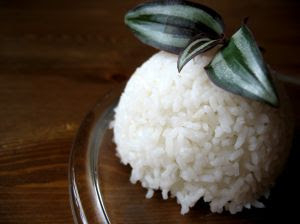 Cook rice (or use precooked rice). Saute margarine and onion in a small skillet. Add broccoli, cheese, milk and cooked rice. Bake in covered casserole at 350 degrees for 35 minutes. Serves 4. Cook rice (or use precooked rice). Brown ground beef and onion in a large skillet. Add tomato sauce, garlic salt, sugar, salt, pepper, oregano and parsley flakes. Cover and simmer 15 minutes. Combine cottage cheese and cooked rice. Put 1/3 of rice mixture in a buttered 2 quart casserole. Top with 1/3 of meat-tomato sauce. Continue to alternate layers, ending with tomato sauce. Sprinkle with shredded cheese. Bake at 325 degrees for 30 minutes, or until hot and bubbly. Serves 6. Fry bacon until slightly brown. Remove bacon from skillet. Empty grease from pan--set aside. Scramble eggs in skillet used to fry bacon. Remove eggs and set aside. Use bacon drippings to fry cooked rice for approximately 5 minutes, stirring constantly. Add remaining ingredients and combine well. Continue cooking for 10 minutes. Serve hot. Cook rice according to package directions. In a large skillet, melt butter and cook onions until tender, but not brown. Add eggs and scramble. Add rice and soy sauce. Stir in peas and ham. Heat through.